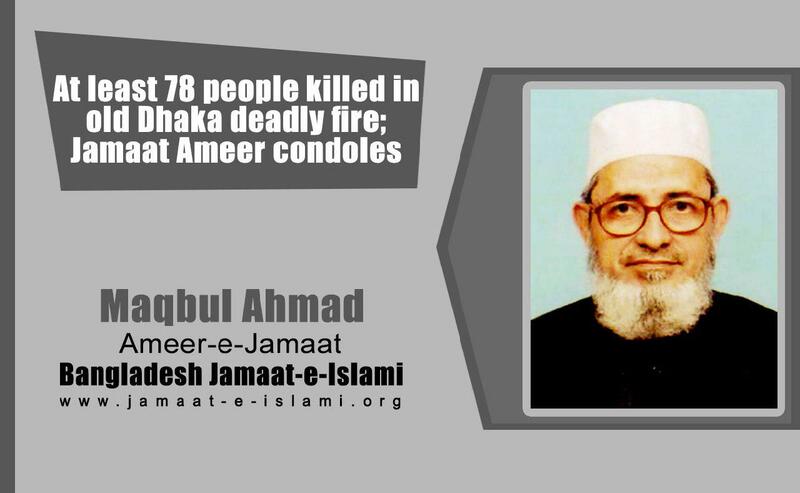 Bangladesh Jamaat-e-Islami’s Ameer Maqbul Ahmad has issued the following statement on 21st February 2019 expressing deep shock as at least 78 people have been killed and hundreds of others became injured during the fire at a chemical warehouse in Chawkbazar area of Old Dhaka on 20 February night. “I am deeply saddened and shocked at the deadly fire accident that took the lives of more than 78 people and injured many others at Chawkbazar area of Old Dhaka. I am urging the concerned authorities to hold proper and fair judicial investigation into the matter for ensuring stern punishment of the responsible personnel. The fellow countrymen observed earlier that scores of people had been killed in different times due to fire in go-downs of the chemical factories and other spots in the same area. Even though, the government remained indifferent. Probe commission was formed in those days as well, but their recommendations left unattended. Everybody is agreed now that, such go-down of the chemical go-down should not be placed in a residential area. But then, how these factories are functioning over there till now? Considering government’s negligence and irrational actions as a blessing, vested greedy traders have established such chemical go-down in a densely populated area like old Dhaka. These shops and go-downs should be relocated at once. I am calling upon the concerned authorities to pay due compensation to the victim families who have lost their dearest one in this accident. Besides, the authority should undertake all out efforts to ensure treatment at free of cost for the injury victims. They should conduct a judicial probe into the accident and relocate the chemical go-downs of these areas immediately. I am praying for the salvation of the departed souls who have been killed in this accident. I am also extending my deep sympathy to all the victim families and praying for the quick recovery of the injured people.